to break the bank? Say hello to Dacia Sandero. Take a look at all of the colour ranges available below. The Sandero has ample room for five adults with a split-folding rear seat and 320 litre boot also make transporting luggage simple. Electronic Stability Control, anti-lock brakes and four front airbags makes sure safety comes as standard. And, with Sandero Lauréate, air conditioning and optional extra cruise control mean maximum comfort on the move. Want a beautiful design that's also easy to use? The Sandero is here. With a ton of optional extras available, simply opt for the MediaNav fully-integrated touchscreen multimedia system, featuring Bluetooth connectivity and ensure safe passage in your journey with satellite navigation, all for £300 extra. Then, there's also the excellently performing TCe 90 3-cylinder petrol engine, which combines impressive performance with efficient fuel consumption and CO2 emissions of just 116 g/km. At Dacia, we believe in giving you the choice to pay only for what you want. That's why our comprehensive standard 3 year / 60,000 mile* warranty may be extended up to 7 years / 100,000 miles. Our simple range offers three trim levels to suit your individual needs; Access, Ambiance and Lauréate. Prices start from just £6,995 on-the-road. 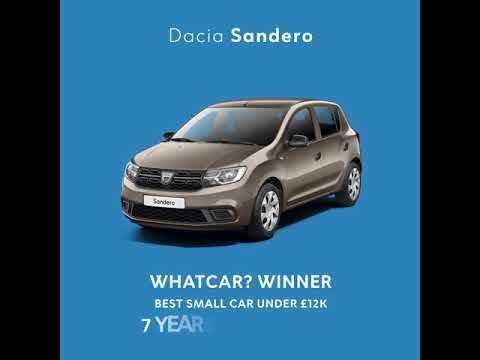 If you are interested in the Dacia Sandero at Charles Hurst Dacia Belfast, Newtownards and Chimney Corner, Mallusk, please contact us today using one of the above contact buttons and a member of our specialist sales team will contact you as soon as possible.